FCA Group’s flagship Motor Village UK dealership has continued to be a draw for visitors with an exhibition of photographs and artwork related to British pop icon David Bowie. 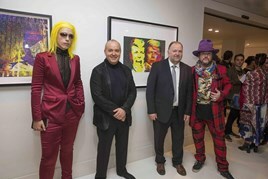 The showroom on Wigmore Street, London, was converted last week into a stylish gallery and private view drinks reception in homage to the ‘Ziggy Stardust’ and ‘Aladdin Sane’ performer last week. Organised and curated for Motor Village UK by artist liaison agent Monica Colussi, the exhibition aimed to salute David Bowie while adding to his legacy with a collection of existing and commissioned work, including paintings, photographs and sculptures. Featured artists include Guido Harari, Rankin, Lincoln Townley and Louis Sidoli. “We’re very happy to host this most important exhibition at Motor Village,” said Rob Calver, managing director, Motor Village UK. FCA Group said that its Motor Village UK showroom was chosen for the Bowie-themed art event because of its central London location and unique design and space. Situated just off Oxford Street, the showroom was originally created in 2008 with future exhibitions, displays and receptions in the plans, as well as the ability to showcase and sell cars. Next week (28 September) in a related event, the Motor Village UK showroom will host an exclusive launch of GQ Magazine editor-in-chief Dylan Jones’ new book, David Bowie: A Life.